Not every slots game needs to be complex in order to be entertaining. Click here to play! When you are simply after a basic slots game that has clear conditions for a win and allows for big wins on comparatively small bets, then the 7 Oceans slots should be high on your list of favorite 3-reel slots. A colorful ocean theme in the background makes playing these slots a more enjoyable experience, but it does not interfere with the simplicity of the game. 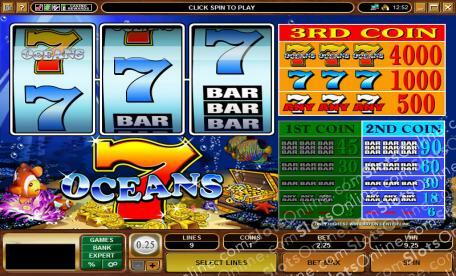 Rather than offering multiple paylines, the 7 Oceans slots allow players to play from 1 to 3 coins. With each extra coin, better prize options become available. The highest jackpot for a single coin bet is just 45 coins, but it goes up to a possible 4000 coins on a 3-coin bet when three 7 Oceans symbols appear on the payline. In fact, big wins on 7 symbols are only available when 3 coins are played per spin, from 5c per coin to $5 per coin. If you just want to be able to get into a game without having to think too much about the rules or about betting too much, too quickly, then the 7 Oceans slots will appeal to you. With only 7s and BAR symbols, and the paytable always in view, you'll always know why you are winning in the 7 Oceans slots.